Those numbers appear to have nothing to do with the obituary information. If you look at the rest of the full page you linked to, you'll see (2) and (c2) and (c8) and (c14) and other such codes in the same location after many of the want ads that are to the right of the obituaries you show in the image. It must be some sort of code used by the newspaper, maybe for example to identify who added the entry. Not the answer you're looking for? 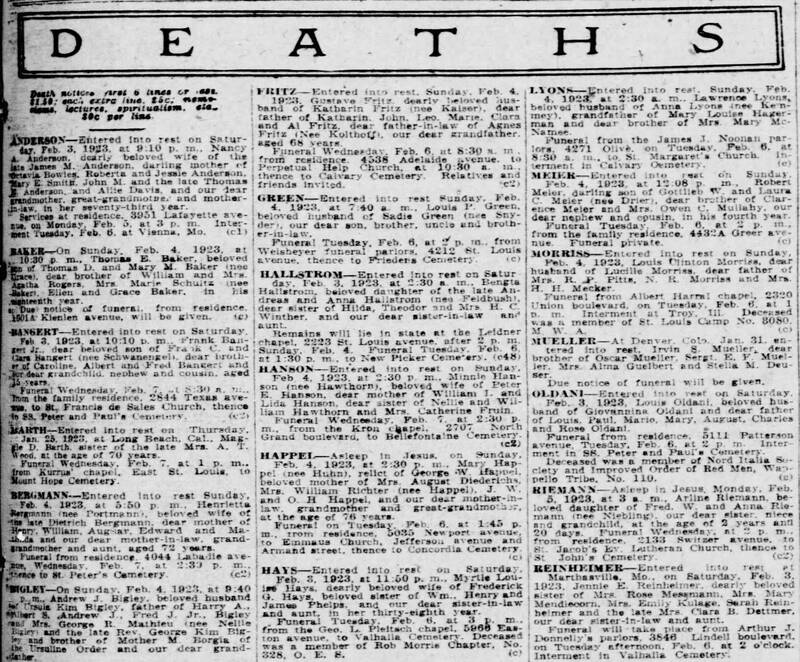 Browse other questions tagged united-states 1920s missouri newspaper obituary or ask your own question. What is this individual's military service number? Can anyone decipher the comment above Louis' name on this 1940 census record? What does it mean for woman to have the title of Mistress in a marriage record? What do C-1 and B-2 mean on 1957 US Immigration record? What public pool is this in Kansas? Meaning of “Tuesday last” and “Monday week”?